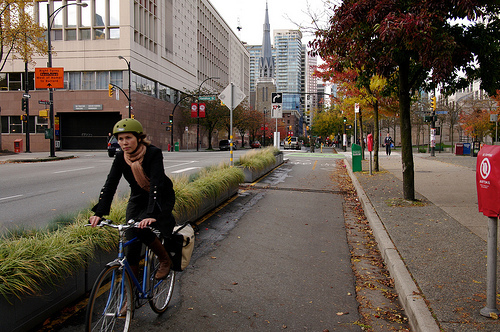 Bike lanes separated by planters, posts or parked cars aren’t just more popular and less stressful than bike lanes or back-road bike routes, an important new study shows. They’re safer — far safer. As reported Monday by Atlantic Cities, researchers found that in Vancouver and Toronto, protected green lanes reduce non-fatal road injuries by 90 percent. That’s a huge impact. When it comes to reducing major injuries, these findings suggest that converting a painted bike lane to a separated cycle track would be twice as effective as painting the bike lane was. The Atlantic’s article rightly called attention to the fact that cheap painted bike lanes can do a lot to improve road safety. So can neighborhood greenways, as long as they pull bike traffic off larger streets. But Portland-based bike experts said Wednesday that this research should also help kill the notion that one bikeway is more or less as good as another. One of several surprises in the study: a local street that’s been designated as a “bike route,” with traffic calming such as speed humps, may be more dangerous than other local streets. In a phone interview, study author Kay Teschke of the University of British Columbia said the reason is that such routes actually become more popular with cars, because they often feature signalized crossings. In further findings that Teschke hasn’t yet published, she said, her team found one key way to greatly improve traffic safety on a neighborhood greenway: cut auto counts by adding traffic diverters at key intersections. 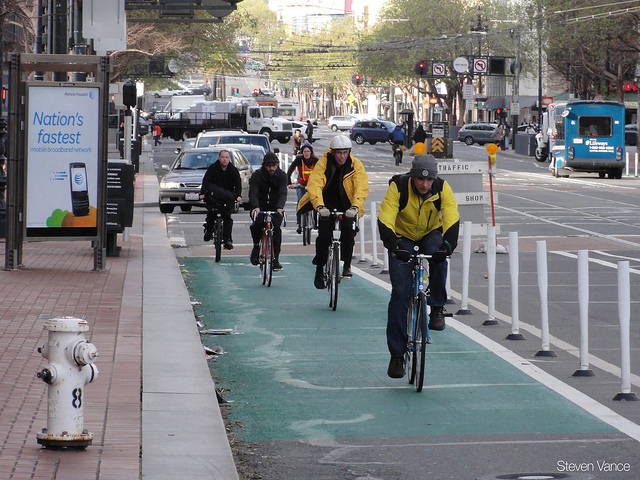 “We found that if you diverted traffic from the local streets, it was just as good as a cycle track,” Teschke said. Michelle Poyourow, a Portland-based transportation planning consultant, said the surprisingly poor safety of “bike route” streets reaffirms her impression that bike boulevards don’t work in the central city. Another big surprise in the new study, which was published online by the American Journal of Public Health: though paved multi-use paths reduce fatal injuries by avoiding cars altogether, multi-use paths were more dangerous than almost any shared roadway when it comes to serious but non-fatal injuries. Teschke, the lead researcher, chalked this up to the way North Americans design paths: for recreation, not transportation. One important caveat with the study: because protected green lanes are so rare outside of Northern Europe, Teschke’s findings on cycle tracks are based on less than 5 kilometers of roadway, all in Vancouver. One reason the findings were so durable: As Teschke’s own data shows, separated cycle tracks tend to become extremely popular once they exist. A Portland-based study published this summer reaffirms this, finding that people will pedal well out of their way to use a separated path. Carlson, the communications consultant, said it’s nice that Teschke’s study supports her gut instinct about which bikeways are best. Carlson said cities looking to encourage biking should be able to use this study to illustrate the benefits of protected green lanes. “For the people who we need to ride bikes — and in my opinion that is women and women with children — leading with ‘safety first,’ both with the actual infrastructure and in messaging, is going to go a long way,” Carlson said. 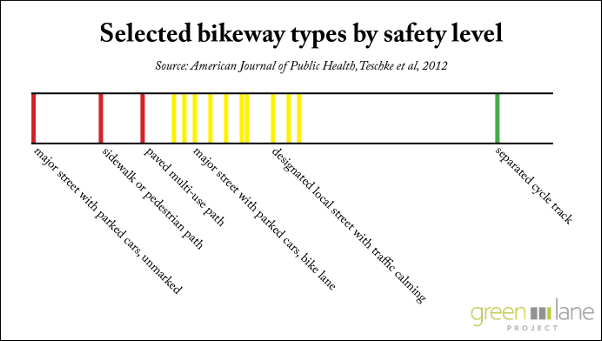 Carlson also noted, merrily, that data used by Teschke shows that though men may claim not to favor separated bikeways when they’re on bikes, the data shows that they steer to low-conflict routes just like everybody else. “They actually know something that feels more comfortable when they see it,” she said.